This is the start of an email I received from Tami Queen at Vocus. Countless accounts of “PR Flaks” who have spammed bloggers, mis-targeted pitches or just plain gotten blogger relations wrong fill the Internet. Don’t risk finding your next pitch blasted on your favorite blog! As a Public Relations professional, it is your job to find every opportunity to get your organization covered and be an expert on the inner-workings of the media. However, the explosion of the blogosphere has left many confused and wondering: How do bloggers operate? What type of approach will get my news covered? How can I integrate blogs into my overall PR strategy? The new media landscape calls for additional tactics and approaches to the PR practitioner’s toolbox. Download the FREE Vocus white paper “ Five Golden Rules for Blogger Relations” to get insights on how today’s PR professionals can successfully incorporate blogger relations into their PR strategy and build effective relationships straight from four of the top blogging experts in the industry! It’s just so ironic. They send out a mass email about how to connect to bloggers? Really? What were they thinking? And the fact that they said “Don’t risk finding your next pitch blasted on your favorite blog!” made it just to tempting not to blast them on my blog. 1) They really don’t get it. That makes it so sad because they claim to be experts in this area. Either way, I don’t appreciate getting this type of email. If you don’t have several hours to kill, do NOT play Desktop Tower Defense. It is highly addictive. Here is a Tower Desktop Defense Blog for tips, videos, news, etc. Do you guys remember AllAdvantage from a few years ago? It was a program that let you install a browser toolbar that showed ads and paid you money. They had a referral program that allowed them to explode their user base. It collapsed once the internet bubble burst, but it was pretty good for a while. I made several hundred dollars from it. Well, the founders of AllAdvantage have started Agloco. It might just have the potential to be big again. You can’t download the toolbar yet, but you can start referring people. The referrals go down 5 levels, so getting in early is great. Naked man arrested for concealed weapon. This may be the funniest headline I have ever read. Check out the whole story, if you dare. I’m not really sure whether to call this thing a game or not, but it’s pretty cool. You can watch an amazing video of a “game” first. 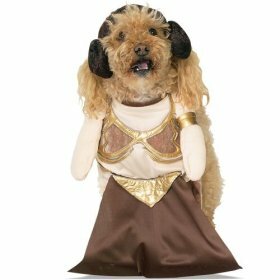 Now that Halloween is approaching, I’ve stumbled across quite a few costumes for pets on the web. This is just so wrong. Do people think their dogs would actually like wearing these things? Is that the best of Bread CD? Let me see it. Can I borrow you glasses, Steve, I’m as blind as a bat. Doesn’t really sound very punk does it? Wow. This is amazing, someone actually started with a single red paperclip, did a series of trades, and ended up with a house. Who Has the Best Pool in Las Vegas?